Add this simple, yet stylish chair to your living room for a great place to sit. 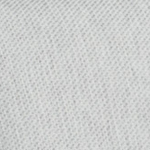 A thick box cushion is filled with a high-quality, high-density foam that promotes both excellent comfort and support. Nailhead trim adorns the rolled scooped arms, base rail, and back rail of the piece. 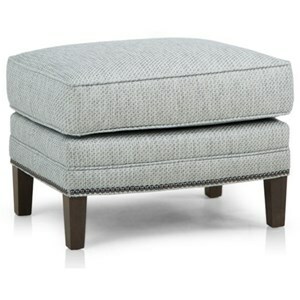 Pair with an ottoman for a great way to relax your feet after a long day. 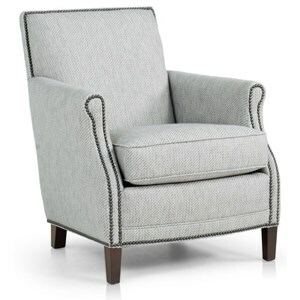 The 517 Casual Chair with Rolled Scooped Arms and Nailhead Trim by Smith Brothers at Sprintz Furniture in the Nashville, Franklin, and Greater Tennessee area. Product availability may vary. Contact us for the most current availability on this product. Browse other items in the 517 collection from Sprintz Furniture in the Nashville, Franklin, and Greater Tennessee area.